Shing Wong Street (Chinese: 城皇街) is a street on the hill slope of Sheung Wan and Mid-levels, Hong Kong. The street extends from Gough Street at its lowest to Caine Road highest. 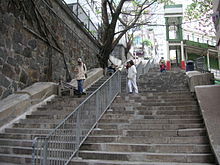 The street is one of ladder streets in Hong Kong, made of stone steps, in the section between Hollywood Road and Caine Road. The Staunton Street ends at Shing Wong Street and Bridges Street extends it west. Bridges Street Market is located their junction. Walking upstair are mixture of modern and pre-World War II buildings till the end of the Shing Wong Street at Caine Road. Wikimedia Commons has media related to Shing Wong Street.